It was thrilling to watch the NASA live feed video from Mission Control as the new Mars Rover "Curiosity" landed safely on Mars late Monday night. Their precision to accomplish such a complicated and delicate mission nearly flawlessly was remarkable. Mission Control was a great combination of anxious anticipation with nervousness, but also confidence and pride that their team had accomplished such a difficult feat so smoothly. 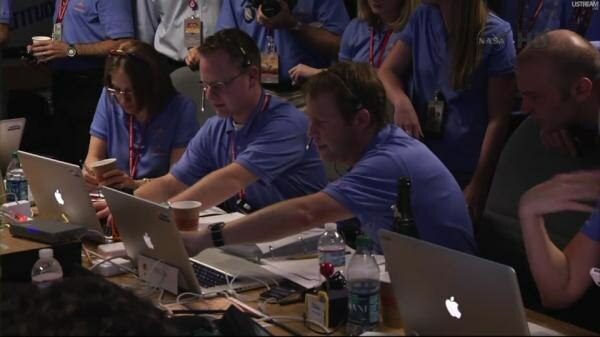 But in the midst of the excitement, I couldn't help but notice that the NASA engineers and flight control team were using Apple MacBook Pro laptops. I love my MacBook Pro, and it looks like NASA loves their MacBooks too. With all due respect to the guys that work at the Apple Store, but these guys have redefined what it means to be an Apple Genius. Well done NASA.